Jharkhand Polytechnic 2019: The JCECEB (Jharkhand Combined Entrance Competitive Examination Board) is responsible for conducting P.E.C.E. (Polytechnic Entrance Competitive Examination) every year. PECE 2019 is the polytechnic entrance exam to get admission in government and private polytechnic colleges of Jharkhand state. Every year, thousands of applicants fill the P.E.C.E. application form, who wants to pursue their career in engineering & non-engineering diploma programs. Applicants can check the details regarding exam dates, PECE Application Form, admit card, eligibility criteria and cut-off in this article. Here we are providing expected Exam Dates of P.E.C.E. 2019. The JCECEB will release the actual dates very soon in the notification. Candidate who wants to appear in Jharkhand Polytechnic 2019 must go through the eligibility criteria before filling the application form. Candidate must be of Indian Nationality and have a domicile of Jharkhand State. The minimum age should be 17 years to apply. There is no maximum age limit. Candidate must pass 10th with minimum 35% marks from the recognized board. Those who want to give Polytechnic Exam can apply online. Applicants have to visit the official website of JCECEB. Make the payment online on or before the last date of submission of application form. Register on the website of JCECEB and log in with your user & password. Fill the personal details and upload images of 10th mark sheet, photograph & signature. After completing this process, please re-check the form and make the correction if requires. Go to next page for payment. The Jharkhand Polytechnic Fees can be paid through online only. General and OBC category have to pay Rs. 625/- as application fee. For SC/ST/Female candidates application fee will be Rs.325/-. Polytechnic 2019 syllabus includes Physics, Chemistry, and Mathematics. All the questions are related to Physics, Chemistry, and Mathematics of 10th standard. Concepts of 10th standard subjects should be clear. You can check the topic-wise syllabus from the official website of JCECEB. The Exam will be held in online mode. Paper will be available in Hindi & English both languages. Multiple Choice Questions will be there from subjects like Physics, Chemistry, and Mathematics. 1 mark will be for each correct answer and .25 marks will be deducted for each wrong answer. Admit card will release probably in the month of May 2019. 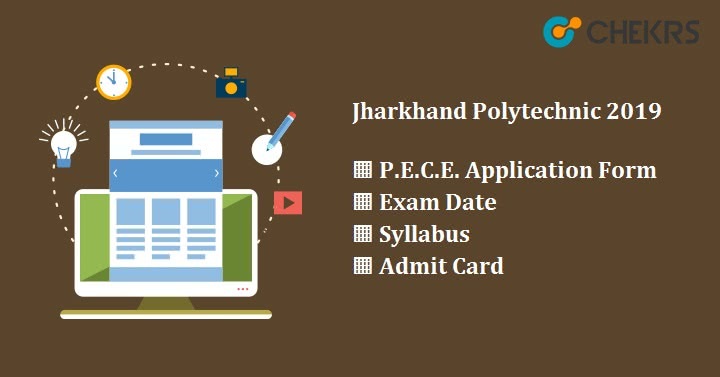 Applicants can download their Jharkhand Polytechnic Hall Ticket 2019 from the official website of JCECEB. For downloading the admit card, one must log in on to the website with their username and password. After logging, click on the given link “Download Admit Card”. Take the print out of downloaded admit card and must carry while appearing for the examination. Without admit card, no applicants will be allowed to enter in examination hall. Here we are providing some tips to crack PECE 2019. The candidate that will follow these preparation tips will definitely get good marks in polytechnic entrance exam 2019. Go through the 10th NCERT Books of Physics, Chemistry, and Mathematics. Solve more questions to manage the time & speed. Focus on formulas and concepts. Focus on each subject not only on your favorite one as each subject contains equal marks. Cut-off will be decided after releasing results. JCECEB will announce the cut-off, those who clear the cut-off marks will be called for counseling process and might be possible they can get government/semi-government or good private polytechnic college. Jharkhand Polytechnic Cut-off vary every year depends on the basis of total application received, last year cut-off, qualifying marks obtained by candidates. Jharkhand PECE Results will declare in the month of June 2019. Candidates can check their result on the official website of Jharkhand Combined Entrance Competitive Examination Board (JCECEB). To download the result, the candidate must know the application number or username & password. Tags:jceceb.jharkhand.gov.in, Jharkhand Polytechnic, Jharkhand Polytechnic 2019, Jharkhand Polytechnic Cut-off, Jharkhand Polytechnic Hall Ticket, P.E.C.E.